The land that is now Red Gate Farms has a long, rich history in Savannah. If the 330-year-old oak trees could speak, they would tell you about the Indians, 18th century colonists, civil war soldiers, and more that crossed the land before Red Gate Farms’ conception as a dairy farm, and later as Savannah’s premier event venue. During the American Civil War, the land that is now Red Gate Farms served as an encampment for Confederate soldiers. Later in the war, the land became occupied by Union soldiers after William T. Sherman’s March to the Sea. Many confederate and union artifacts have been recovered on Red Gate Farms. Years later, the Spanish American War began, and a powder magazine used to house ammunition was built on land adjacent to what would become Red Gate Farms, and the magazine keeper’s house was built on the land. Today, you can still see what is left of the powder magazine off Ogeechee Road, and the keeper’s house still stands on Red Gate Farms. In 1931, Harry Martin, a direct descendant of a Scottish Highlander that later became the governor of the Georgia colony, and his wife, Mamie, bought 440-acres of land and converted it into a jersey cow farm. They named their farmlands “Red Gate Farms” in honor of a relative, Cyrus Steadwell, who was killed in France during World War I. Cyrus had always mentioned that he wanted to own a farm one day and name it “Red Gate”. Harry Martin was considered a folk hero for leading many fights to lower milk prices. His constant campaigning eventually led to fair milk prices for everyone. 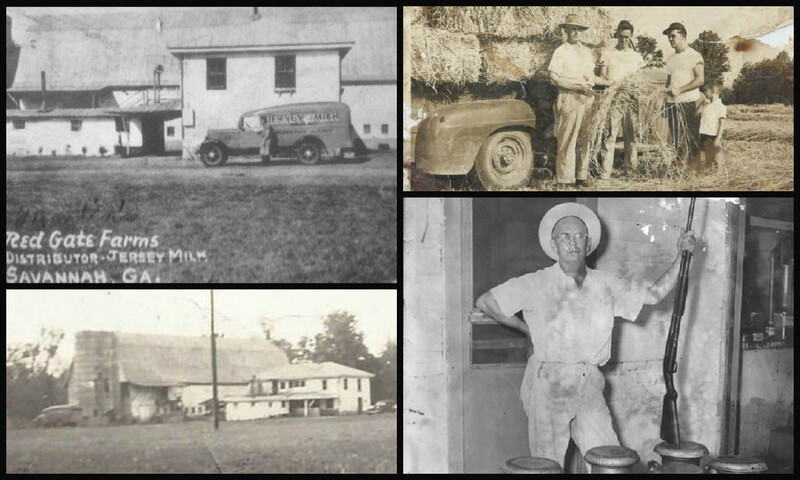 Although the 140 jersey cows, chickens, and other farm animals no longer wander the land, the Martin’s instilled a strong work ethic in their grandchildren and great grandchildren, and more than 80 years later, they still run Red Gate Farms as the stunning event venue it is today.